Serious questions in a moment, but for hysteria Renwick need only visit Hot Topic. The toxic drivel from this local stronghold of warmists is republished on the Royal Society’s own lickspittle website, SciBlogs, so Renwick can claim ignorance of it to the same extent that he can justify his association with it. When its history is written, the current chapter of the formerly illustrious RSNZ will come to be seen as its most ethically forlorn. For the RSNZ is engaged wholeheartedly in climate activism while entirely disengaged from scientific reflection and process. These scientists allow Hot Topic daily to pour scorn, ad hominem invective and worse on every visitor with doubts about global warming orthodoxy or who refuses to embrace Gareth Renowden’s religious climate change zeal. The site is an excellent example of the climate hysteria of which Renwick claims ignorance. Renwick’s own use of the obnoxious, pejorative epithet “climate deniers” to refer to climate sceptics is another example of this hysteria, for a confident, capable scientist would simply answer their doubts with science. What is the evidence that there should be a constant climate? For 4.2 billion years, climate has always been getting warmer or colder, wetter or drier, and there has never been runaway warming or cooling. What is the evidence that the putative change from rising carbon dioxide in the atmosphere due to fossil fuel use would be large or damaging? Output from computer models is not evidence unless model performance has been validated and so far it has not. For significant global warming to occur, positive (or destabilising) feedback processes, such as rising water vapour concentration, are required for significant global warming to occur. What is the evidence that they have begun? How can you maintain your hypothesis of dangerous anthropogenic global warming (DAGW), despite scientific evidence to date suggesting that negative (stabilising) feedback processes prevail, possibly due to the cooling effect of increased cloudiness from water vapour increase? What evidence is there that “climate change” is caused by carbon dioxide from human activities and not natural processes? This must be provided. What is the evidence that the influence of increasing human-produced carbon dioxide on global warming is discernible? What is the evidence that warming will be significant? For the last 20 years there’s been no significant warming. No evidence that atmospheric radiation can warm the ocean. No evidence of significant melting of ice sheets or glaciers. No evidence that man-made CO2 detectably warms the earth. No evidence of increasing hurricanes, storms, droughts or heat waves. No evidence of substantial or widespread decrease in ocean alkalinity. No evidence of positive feedback in atmospheric water vapour. No doubt Chris himself has further serious questions, but these are what I can think of. De Freitas states that there is no evidence to distinguish between “natural” and “human-caused” warming. There is an 86-page chapter on this topic in the last IPCC report, citing over 600 scientific papers on the subject. The conclusion was: “It is extremely likely that human activities caused more than half of the observed increase in Global Mean Surface Temperature from 1951 to 2010.” How can this be characterised as “no evidence”? It’s not hard, since no evidence is presented. In CLIMATE CHANGE 2013 The Physical Science Basis, Chapter 10 Detection and Attribution of Climate Change: from Global to Regional, p894, there is a revealing description of attribution studies. Here’s what the IPCC says (my emphasis). FAQ 10.1 | Climate Is Always Changing. How Do We Determine the Causes of Observed Changes? They claim a human fingerprint is “clearly apparent” but consider this: the “fingerprints” of a human influence on climate are “derived” from a computer model, and a computer model is constructed from our knowledge of climate processes, which means we create the “fingerprints” it produces of a human influence, which “prove” to us there’s a human influence. Tell me this is not a circular argument, ipso facto, there’s no evidence. To conclude that it must be we wicked humans is not science, it’s policy looking for a pretext. these scientists would still be looking for an answer; instead they’re shouting at us. they would be modest, restrained and happy to hear questions and doubts; instead they insult us. they would have developed a single skilful model, because we only need one. they would not pretend that the average of a hundred or more incorrect models is somehow the truth. they wouldn’t have prepared policy prescriptions before they announced the crisis. Above all, if it were science, they wouldn’t belong to a political committee called “intergovernmental”. Dialogue is impossible when one side is spouting rubbish. ◾For the last 20 years there’s been no significant warming. ◾No evidence that atmospheric radiation can warm the ocean. Why are you ignoring conduction and convection? ◾No evidence of significant melting of ice sheets or glaciers. ◾No evidence that man-made CO2 detectably warms the earth. ◾No evidence of increasing hurricanes, storms, droughts or heat waves. The big reinsurers believe that there is and they have a lot of money riding on this. ◾No evidence of substantial or widespread decrease in ocean alkalinity. ◾No evidence of positive feedback in atmospheric water vapour. Spouting rubbish, am I? Then prove it, Noddy. It’s tedious when I’m still waiting patiently on all the other times I’ve asked you politely, but prove it. And I mean each iteration of ‘false’. Because heat rises, and because of that simple fact of physics it’s vanishingly unlikely (I’m 95% certain) that the amount of heat energy in the atmosphere generated only by our emissions can significantly heat the oceans. But I didn’t say it’s impossible, just that there’s no evidence. So if there is evidence of significant warming available by this means, please feel free to present it. This would be funny if there wasn’t so much money riding on it. You refer to the big reinsurers as though they’re reliable witnesses, but they are foxes in charge of the flamin’ henhouse. They have an enormous incentive to scare the policyholders out of their wits. OF COURSE the insurers believe that these perils will increase… sorry, I mean, state endlessly that these perils will increase, because IT LETS THEM RAISE THEIR PREMIUMS! (Sorry for shouting, but I’ve said it many times.) They are making billions from this scam. They have no credibility in the matter. Evidence is always persuasive. ◾ For the last 20 years there’s been no significant warming. True. The El Nino warming is gone, temperatures are on the way back to neutral (see GISTEMP, UAH, RSS) and there’s a La Nina on the way i.e. the “pause/hiatus” is back. ◾ No evidence that atmospheric radiation can warm the ocean. We’re not Simon. Look at the typical earth’s energy budgets at surface. Tropical Pacific (Fairall et al) vs Global (Stephens et al) vs Southern Ocean (Shulz et al). The Pacific Ocean gains heat in the tropics and loses heat north and south in the high latitudes. There is no heat gain in either tropical Pacific, or Global, or Southern Ocean from “man made heat” by any energy transfer flux – radiation, sensible heat, or latent heat. ◾ No evidence that man-made CO2 detectably warms the earth. True Simon. Look at the surface energy budgets above. There is no net DLR flux into the earth’s surface. CO2 is only about 2 – 3% of total DLR anyway. Even if there was a net DLR flux, there could be no warming because DLR only penetrates water a maximum of about the thickness of a human hair (100 microns) in ideal conditions, land matter even less. But the critical criteria (as per IPCC) is the earth’s energy budget at TOA – not all the above. Theoretical CO2 forcing at TOA was 1.9 W.m-2 @ 400ppm (1.83 in AR5). Total effective radiative forcing including solar (ERF) was 2.33 W.m-2 in AR5. Theory is 4 times actual and increasing. CO2 theory is 3 times actual and increasing. Theory is falsified. If CO2 does not pass the critical climate change criteria (it doesn’t), there is no need to consider any other secondary sub-criteria. That’s ALL of the above in Richard Treadgold’s post Simon – ALL immaterial and irrelevant once theory is falsified at the primary level. This was of course dismissed out of hand by the IPCC AR5 WG1 Chapter 10 Detection and Attribution authors when in the Chapter 10 review process, John McLean demanded a retraction of attribution that depended on false AO interface physics. Not the only false physics that the man-made climate change conjecture depends on either. The entire AGW notion of heat moving from a cold object (troposphere) to a warm object (surface) violates the Clausius statement of the Second Law of Thermodynamics. A violation proven by the earth’s energy budgets upthread. You wont read about that in any IPCC assessment report though. It would NEVER get past the review gatekeepers as in the case of McLean above. Because the storage of heat in the ocean has been implicated in the recent warming slowdown as measured by GMST, participants discussed the limitations of using GMST as the primary metric of global climate change. Many participants supported the notion that, because 93 percent of the excess heat from GHGs is stored in the ocean, sea-level rise, or sea-level rise together with GMST, may be a more appropriate metric of global climate change. It is certainly gratifying to see this topic [‘Decadal Climate Variability’] being addressed by the NAS, since decadal variability is too often dismissed by the ‘establishment’ as climate ‘noise.’ The questions asked in the report, and the knowledge gaps, raise the important unresolved issues. There are no particularly new insights in the report, and there is much interesting (and recent) research on this topic that didn’t get mentioned. The most scientifically interesting chapter is the one on Modes and Mechanisms of Internal Variability, particularly Mechanisms Driving Pacific Decadal Variability (specifically, the work of Antoinette Capotondi). There is also an interesting section The Role of Uncertainty, mostly from the work of Baylor Fox-Kemper, that addressed uncertainties air/sea exchange rates and the deep storage of heat in the ocean. What is missing from the report is the longer term context of multidecadal to millennial variability, and the importance of paleoclimate observations. Without this context, we are not going to make much progress on understanding and predicting the decadal variability in the Atlantic, Pacific, Indian Oceans. #The Earth system (land, atmosphere, and ocean) continues to steadily warm through time in response to increasing greenhouse gases (GHGs) in the atmosphere from human activities. # A slowdown in the rise of GMST is not equivalent to a slowdown in global warming. Viewed over long time periods (50+ years), there is a persistent increase in GMST. However, it remains important to understand the decadal variability in GMST that is observed over shorter time periods. # Longer trends (50 years or more) in observed global mean surface temperature (GMST) in the recent century largely reflect increases in anthropogenic greenhouse gases. 1) Begin will a false-physics premise and make a miss-attribution. 3) Construct a psuedo-scientific meme. 2) Pull in whatever metric supports the psuedo-science. Problem is, as Beenstock et al find, 65% of good quality long-running tide guage stations exhibit flat or falling sea levels. The very same thought crossed my mind too. They’ve lost at TOA, lost at GMST, so inevitably they have to go to the ocean. They’ll lose there too. The physics and heat budgets preclude a win. When people with enough transferrable heat smarts investigate their “93 percent of the excess heat from GHGs is stored in the ocean” meme, they will find the claim has no basis in fact. Again (from last post), this is a monumental scientific fraud. It;’s not about science anymore, the Left have lost that. It’s about ideology and dissent now. What exactly is “a load of rubbish”? What part of that large web page are you wanting us to read? Global 0 – 2000m OHC is down considerably, North Pacific is up. They had to lever it in some how. Odd that human heat only enters the Atlantic and Southern Oceans though. And only at 700–1,500 m.
OHC integrated from the surface to indicated depths in global oceans, the Atlantic, Southern Ocean, Pacific and Indian Ocean from the Ishii data (a,d,g,j,m) and the ensemble means of the CESM Hiatus (b,e,h,k,n) and Surge (c,f,i,l,o) groups. All the curves are shown as a 12-month running mean by subtracting the annual mean value of the first year (year 1970). Note that the anomaly is from start date 1970 – not as per the NODC data above. There is nothing in common in the 4 obs profiles: d Atlantic, g Southern, j Pacific, m Indian. It is impossible to make the attribution (only "reflects" note) Liu, Xie,and Lu make. Solar heating is the sole source of the ocean heat because it is the only net downwards flux in the surface heat budgets upthread. Ocean warming by GHGs is an impossiblity because there is no net GHG flux down and the Atm-Ocean (AO) radiation-matter physics prohibits it anyway as does the Second Law of Thermodynamics. The anthro miss-attribution is a monumental scientific fraud and provably so as above from the "well studied and is well understood" OHC data and the criteria as mentioned previously. What, specifically, is “a load of rubbish”? Then I agree with you Simon, it is “a load of rubbish”. It is also a physical impossibility given the earth’s heat budgets upthread, the AO interface physics, and the Clausius statement of the Second Law of Thermodynaomics. Again, that miss-attribution is a monumental scientific fraud and provably so. BIG PROBLEM for the Warmies. 0 – 2000m OHC 1950 – 2004 about 22 x 10^22 Joules or 220 ZetaJoules (10^21) assuming data from 1950. Murphy et al (2009) total accumulated theoretical forcing 1950 -2004 (GHGs + Solar) 1700 ZetaJoules. About 100 solar, residual 1700 – 100 = 1600 x 93% = 1488 to ocean from GHGs theoretical. 220 – 100 solar = 120 actual estimate. 120 ZetaJoules to ocean from GHGs – Obs estimate assuming data from 1950 and solar estimate correct. [SPM](Box 13.1 fig 1) The Earth’s energy budget from 1970 to 2011. Cumulative energy flux (in zettaJoules!) into the Earth system from well-mixed and short-lived greenhouse gases, solar forcing, changes in tropospheric aerosol forcing, volcanic forcing and surface albedo, (relative to 1860–1879) are shown by the coloured lines and these are added to give the cumulative energy inflow (black; including black carbon on snow and combined contrails and contrail induced cirrus, not shown separately). This chart summarizes the impact of different drivers of warming and/or cooling, by showing the total cumulative energy added to the earth system since 1970 from each driver. Note that the chart is in zettajoules (10^21J). For comparison, one zettajoule is about the energy that would be released from 200 million bombs of the size of the one dropped on Hiroshima. The world’s total annual global energy consumption is about 0.5ZJ. [SPM] (Box 3.1 Fig 1) Plot of energy accumulation in ZJ (1 ZJ = 1021 J) within distinct components of Earth’s climate system relative to 1971 and from 1971–2010 unless otherwise indicated. Ocean warming (heat content change) dominates, with the upper ocean (light blue, above 700 m) contributing more than the deep ocean (dark blue, below 700 m; including below 2000 m estimates starting from 1992). Ice melt (light grey; for glaciers and ice caps, Greenland and Antarctic ice sheet estimates starting from 1992, and Arctic sea ice estimate from 1979–2008); continental (land) warming (orange); and atmospheric warming (purple; estimate starting from 1979) make smaller contributions. Uncertainty in the ocean estimate also dominates the total uncertainty (dot-dashed lines about the error from all five components at 90% confidence intervals). The last 2 sentences are complete bunkum. There was never the 1400ZJ of GHG “energy” to begin with. The only “energy” is solar “energy”. Except OLR is static and so is the earth’s energy imbalance at a measly 0.6 W.m-2. Watch the El Nino effect on that. And the onjly “trapped” energy in the climate system is in the ocean heat sink and it is solar-sourced heat. That’s why it is called a heat sink. The atmosphere is a bit player, not a heat sink, and merely an energy transfer medium from surface to space. Kevin Trenberth says the oceanic heat sink adds “10-100 years” to the climate system i.e. an atmospheric temperature response to a change in solar ocean heating takes “10-100 years”. Atmospheric temperature rises in response to oceaninc heat sink gain from solar forcing at the surface (SSR) – not from the wildly excessive and redundant GHG “energy”. But 13.1-Fig-1 shows theoretical GHG forcing of 1400ZJ. We are told that “93 percent of the excess heat from GHGs is stored in the ocean”. That’s 1302ZJ. 1302ZJ does not equal 275ZJ. Even if we use the effective “total energy” value from 13.1-Fig-1, 93% of 800ZJ still does not equal 275ZJ. The forcings in 3.1 Fig 1, including solar (TSI), all apply to the TOA energy budget – not the surface. The heat storage in the ocean is forced by surface solar radiation (SSR). SSR forcing is in the order of 10 W.m-2/decade regionally.The surface energy imbalance is around 0.6 W.m-2 for comparison. SSR forcing far exceeds TSI forcing at TOA, and SSR is the surface heating agent that easily explains 275ZJ ocean storage 1971–2010 once the effect of aerosols and land use change are accounted for. The theoretical GHG forcing (1400ZJ) is completely redundant to ocean heat. The surface heat budgets upthread prove that. Why don’t Warmies check the actual data BEFORE making their brainless claims? They’re so fixated on what they THINK is happening that it never occurs to them to check the facts. Solar energy in => oceanic heat sink => energy out to atmosphere (hence “temperature +”) + space (OLR). “GHGs in atmosphere” have no effect whatsoever on OLR (see obs graph upthread) contrary to Steve’s “system” showing “outgoing infra-red radiation +”. The difference between energy in and energy out is the TOA energy imbalance – not a “net radiative forcing +/-” LOOP which is merely theory, and wrong given the respective values. So because systems guy Steve got his LOOP system wrong (he’s out of his depth in other words), he ties himself in knots trying to explain away the glaring discrepancy between theoretical accumulated GHG forcing and actual accumulated ocean heat. Herein lies the fallacy of LOOPY climate systems. Global solar irradiance showed a significant fluctuation during the last 90 years. It increased from 1920 to 1940–1950s, thereafter it decreased toward late 1980s. In early 1990s 75% of the glob indicated the increasing trend of solar irradiance, while the remaining area continued to lose solar radiation. The regions with continued dimming are located in areas with high aerosol content. The magnitudes of the variation are estimated at +12, −8 and +8 W m−2, for the first brightening, for the dimming and the recent brightening periods, respectively. The global dimming of −8 W m−2 and recent brightening of +8 W m−2 are considered to be caused by the variations in the aerosol content in the atmosphere. The 40-year period of dimming and the subsequent brightening offer an opportunity to separate aerosol effect into the direct and indirect effects, and further, to evaluate the surface temperature sensitivity due to radiation change. The collection of observed irradiances in GEBA and BSRN was used to evaluate the aerosol effects and the climate sensitivity mainly on the basis of observational material. The direct and indirect aerosol effects are found to possess about the equal importance. The temperature sensitivity of the radiation change is estimated at 0.05 to 0.06 K/(W m−2). The cause of the earlier brightening leading to 1950s remains unknown, and it is unlikely that the aerosol variation could have caused a brightening during the earlier half of the twentieth century. Other possible causes include the effect of the variation of the Sun. Net SSR forcing 1920s – 2005: +12 W.m-2. FAQ 2.1, Figure 2. Summary of the principal components of the radiative forcing of climate change. All these radiative forcings result from one or more factors that affect climate and are associated with human activities or natural processes as discussed in the text. The values represent the forcings in 2005 relative to the start of the industrial era (about 1750). SSR forcing at Sfc is estimated +12 W.m-2 1920s – 2005. SSR is 120 times greater than TSI at TOA. Hence the ocean heat miss-attribution by the IPCC and climate science generally. +12 W.m-2 (1920 to 2005) x 0.055 = +0.66 K.
[IPCC AR5] (Fig SPM.1) Observed globally averaged combined land and ocean surface temperature anomaly 1850-2012. The top panel shows the annual values; the bottom panel shows decadal means. (Note: Anomalies are relative to the mean of 1961-1990). One day, far off in the future, Warmies and LukeWarmies will figure this out. But it will take time. Lots of time. They are really REALLY slooooow at figuring stuff like this out.. The total internal energy of the whole ocean is more than 1,600,000 ZetaJoules, about 2000 times larger than the total internal energy, 940 ZetaJoules, of the whole atmosphere. That’s a lot of “Hiroshima bombs”. Easterbrook – “one zettajoule is about the energy that would be released from 200 million bombs of the size of the one dropped on Hiroshima”. So 1.6 million x 200 million = 320,000,000 million “Hiroshima bombs” of heat in the ocean. Question: What is the source of the ocean heat? 275 ZetaJoules increase 1971–2010 is 0.017%. Climate scientists were quick to ask the U.K.’s Royal Astronomical Society to suppress Zharkova’s findings. “The Royal Astronomical Society replied to them and CCed to us and said, ‘Look, this is the work by the scientists who we support, please discuss this with them,’” Zharkova told the GWPF. “We had about 8 or 10 exchanges by email, when I tried to prove my point, and I’m saying, I’m willing to look at what you do, I’m willing to see how our results we produced and what the sun has explained to us,” she said. “So how this is transformed into climate we do not produce; we can only assume it should be. So we’re happy to work with you, and add to your data our results. “So don’t take the sunspots which you get, we can give you our curve. Work with our curve. So they didn’t want to,” she said. Experiments with climate models show that only by including greenhouse gas increases can we capture the rise in global temperatures over the past 60 or more years. Changes in the Sun’s output or other “natural” factors just don’t do it. The climate models use TSI at TOA but not SSR. So of course they get it wrong in the models – GIGO. SSR forcing at Sfc is estimated +12 W.m-2 1920 – 2005. Theoretical GHG forcing is far in excess of actual earth’s heat as detailed upthread – GIGO again. Most of the extra warming coming from increased carbon dioxide is warming the oceans – they absorb more than 90 per cent of the heat……. This is a falsehood. A miss -attribution. Unsubstantiated by the IPCC. And physically impossible as detailed upthread. GIGO all the way down. They try to simulate SSR (not parameterize note) but they get that wrong so effectively GIGO. Received 5 October 2006; revised 23 December 2006; accepted 5 February 2007; published 8 March 2007. 1 Department of Applied Physics and Mathematics, Columbia University, New York, New York, USA. 2 Lamont-Doherty Earth Observatory, Columbia University, Palisades, New York, USA. 3 NASA Goddard Institute for Space Studies, New York, New York, USA. 4 Sigma Space Partners, New York, New York, USA. The amount of solar irradiance reaching the surface is a key parameter in the hydrological and energy cycles of the Earth’s climate. We analyze 20th Century simulations using nine state-of-the-art climate models and show that all models estimate a global annual mean reduction in downward surface solar radiation of 1–4 W/m2 at the same time that the globe warms by 0.4–0.7C. In single forcing simulations using the GISS-ER model, this ‘‘global dimming’’ signal is shown to be predominantly related to aerosol effects. In the global mean sense the surface adjusts to changes in downward solar flux instantaneously by reducing the upward fluxes of longwave, latent and sensible heat. Adding increased greenhouse gas forcing traps outgoing longwave radiation in the atmosphere and surface which results in net heating (although reduced) that is consistent with global warming over the 20th Century. Over the 1984–2000 period, individual model simulations show widely disparate results, mostly related to cloud changes associated with tropical Pacific variations, similar to the changes inferred from the satellite data analysis. This suggests that this time period is not sufficient to determine longer term trends. Over the 20th Century all models show global mean decreases (Figure 1a) in SWD ranging from 1 to 4 W/m2 alongside near-surface temperature increases ranging between 0.4 and 0.7C. We construct a multi-model mean using an equal weighting for each model’s ensemble mean (Figure 1b) which shows decreases in the SWD of up to 0.07 W/m2/yr regionally. Demonstrably false, as detailed upthread. This demonstrates perfectly how solar forcing in climate models is garbage. And garbage in gives garbage out (GIGO). Atsumu Ohmura (2009), see upthread, has SSR forcing INCREASING (+ve)12 W.m-2 from 1920 – 2000. Climate models have SSR forcing DECREASING (-ve)1 to (-ve)4 W/m2 over the 20th Century. He seems fairly confident about a 1m sea level rise projection by 2100. I am less sure, but at least I acknowledge that he knows more about the subject than I do. Really just stating the obvious and basically a no-brainer. So OK, where’s the “key parameter” SSR in the IPCC’s table of forcings? Conspicuously absent. Why? Reason: Those 8-17 forcings are only applicable at TOA and from 1750. The major 20th Century forcing at the SURFACE (SSR) far exceeds any forcing at TOA from 1750, real or not. This “concept” is the fatal flaw in IPCC reasoning and climate modeling. It neglects the major (by far) 20th century forcing SSR. Renwick’s not an oceanographer. And it wouldn’t take much to know more than you Simon. But Renwick’s basing his confidence on the IPCC’s fatally flawed radiative forcing concept (see previous comment). Andy beat you by 2 and half hours Simon. If you actually followed these threads you wouldn’t keep coming up with mindless trivia. Not implying that Andy’s first reference to Renwick was “mindless”, just Simon’s second reference to exactly the same article was. Johnny-come-lately Simon (as always) comes in at #32 duplicating #29 by Andy. But as trolls go, Simon’s “mindless trivia” is as good as any I suppose. He’s the only regular troll we’ve got now so we haven’t got much choice anyway. Following these threads is impossible due to the gross regurgitation and verbiage that lie in between. In other words, you have a gross comprehension problem Simon. An inability to comprehend. Explains why you never learn anything Simon. Have you tried a remedial reading course? Observations indicate that greenhouse induced twentieth-century warming has been strongly modulated by variations in surface solar radiation. Between the 1950s and 1980s, declining surface solar radiation (“global dimming”) likely caused a dampening of global warming, whereas increasing surface solar radiation (“brightening”) may have contributed to the rapid warming in the last 2 decades, and possibly also in the first half of the twentieth century. This is also reflected in the decadal evolution of diurnal temperature range, which is highly correlated with surface solar radiation, and which shows a distinct transition from a strong decrease between the 1950s and 1980s, toward a leveling off thereafter. The present study investigates to what extent these effects are simulated in the latest generation of global climate models used in the fourth Intergovernmental Panel on Climate Change (IPCC) assessment report (AR4) (phase 3 of the Coupled Model Intercomparison Project (CMIP3) models). While these models reproduce the overall twentieth century warming over global land surfaces well, they underestimate the decadal variations in the warming and particularly also in diurnal temperature range, indicative of a lack of decadal variations in surface solar radiation in the models. Observations indicate that solar radiation incident at the Earth surface underwent substantial decadal variations in the second half of the twentieth century, with a tendency towards reduction from the 1950s to the 1980s (“global dimming”) and a partial recovery thereafter (“brightening”) at widespread locations. The most reliable observational records from the Global Energy Balance Archive (GEBA) are used to evaluate the ability of the climate models participating in CMIP3/IPCC-AR4 as well as the ERA40 reanalysis to reproduce these decadal variations. The results from 23 models and reanalysis are analyzed in five different climatic regions where strong decadal variations in surface solar radiation (SSR) have been observed. Only about half of the models are capable of reproducing the observed decadal variations in a qualitative way, and all models show much smaller amplitudes in these variations than seen in the observations. Largely differing tendencies between the models are not only found under all-sky conditions, but also in cloud-free conditions and in the representation of cloud effects. The ERA40 reanalysis neither reproduces the major decadal variations in SSR, despite strong observational constraints on the temporal evolution of the state of the atmosphere, since time varying aerosol loadings are missing. Climate models and reanalyses are therefore not yet at a stage to provide regionally consistent estimates of decadal changes in SSR. Reproduction of these changes would be essential for an adequate representation of regional scale climate variations and impacts, and short-term (decadal) climate projections. satellite observations but differ in sign and magnitude from previously reported ground observations. Unlike ground stations, satellites can uniformly sample the entire globe. SSR explains 20th century warming without recourse to GHGs. >”Did the IPCC ignore this?” Do we need to ask? Nothing in AR5 that I can see. Be interesting to see what they made of this in AR5 Chapter 3 especially. Chapter 3 refers to Pinker et al 2005 but it is probably the same paper. The increase in surface solar radiation (‘brightening’) agrees with satellite and surface observations of reduced cloud cover (Wang et al., 2002b; Wielicki et al., 2002a; Rossow and Dueñas, 2004; Norris, 2005b; Pinker et al., 2005), although there is evidence that some of these changes are spurious (see Section 3.4.3). In addition, the satellite-observed increase in surface radiation noted by Pinker et al. (2005) occured primarily over ocean, whereas the increase observed by Wild et al. (2005) was restricted to land stations. So they throw out the “key” surface warming agent (”The amount of solar irradiance reaching the surface [SSR] is a key parameter in the hydrological and energy cycles of the Earth’s climate” – Romanou et al 2007) because it doesn’t fit their RF paradigm. The “key” ‘surface forcing’ agent they threw out is far greater than any RF forcing agent at TOA. This is not an “assessment”, it is self-justification of their fatally flawed RF “concept”. Which explains why their subsequent attribution is a miss-attribution i.e. false. Seems easy enough. Why couldn’t the IPCC do this? Surface incident solar radiation (Rs) drives weather and climate changes. The surface incident solar radiation (Rs) absorbed at the surface drives weather processes through latent and sensible heat fluxes [Wang et al., 2010a, 2010b] and longwave radiation emission [Wang et al., 2005]. It therefore determines the Earth’s weather and climate, and its change results in climate and environmental change [Trenberth and Fasullo, 2010]. Surface incident solar radiation (Rs, SSR), Romanou et al’s “key parameter”. Thrown out by the IPCC. IPCC “assessment” is scientifically fraudulent. Recent variations in surface solar radiation (SSR) at the beginning of the 21st century (2000–2007) were determined at scales ranging from local/regional to hemispherical/global, on the basis of radiative transfer computations and information from satellites, reanalyses and surface measurements. Under all-sky conditions, in the Northern Hemisphere (NH) there is no clear dimming/brightening signal after 2000, whereas in the SH there is a more clear dimming arising from both increasing clouds and aerosols. Dimming is observed over land and ocean in the Southern Hemisphere (SH), and over oceans in the NH, whereas a slight brightening occurred over NH land. However, opposite tendencies are found even within the same continent, indicating the need to assess SSR changes at regional/local scales apart from hemispherical/global ones. Tendencies of SSR beyond 2000 were examined also on the hemispheric scale, as well as over land and ocean areas separately (Figure 3). The computations for the period 2001–2006, also compared for the sub-periods 2001–2005 and 2002–2006, are summarized in Table I . The selection of these different time periods for the computation and comparison of SSR tendencies was made to ensure the robustness of the computed tendencies, given the relatively short time period covered. The tendencies agree in terms of their sign, but also of inter-hemispherical and land–ocean GDB [Global Dimming Brightening] differences, which strengthens the robustness of the conclusions on GDB. Therefore, the discussion is henceforth focused on the results for the period 2001–2006. In the Northern Hemisphere (NH) (including land, ocean and coastal areas), SSR has just slightly increased, by 0.17 W m−2 (or 0.028 W m−2 year−1), while it has significantly decreased by 2.88 W m−2 (or 0.48 W m−2 year−1) in the Southern Hemisphere (SH). Thus, it appears that there is an inter-hemispherical difference in GDB, consisting of a slight brightening in the NH against a stronger dimming in the SH. If averaged globally, they yield an overall dimming equivalent to − 1.53 W m−2 (or − 0.26 W m−2 year−1). Hinkelman et al. (2009) reported a dimming in both hemispheres, of about − 0.51 W m −2 year−1. The differences with our results, especially in NH, may be attributed to their shorter time period (1999–2004), which starts and ends earlier than ours thus not including mostly positive SSR anomalies in the NH after 2004 (Figure 3(a)). In addition, the year 2000 is largely characterized by positive SSR anomalies which, if taken into account, result in a dimming of − 0.39 W m−2 year−1 in NH over the period 2000–2007. The overall all-sky dimming beyond 2000 seems to mark a change in the GDB pattern at the dawn of the 21st century, since an overall brightening of 0.15–0.24 W m−2 year−1 occurred from the early 1980s to 2000 (Hatzianastassiou et al., 2005; Pinker et al., 2005; Wild et al., 2005). Our separate analysis over land and oceans indicates the existence of opposite tendencies in SSR. Thus, SSR exhibits an increase (brightening) of 0.44 W m−2 (0.07 W m−2 year−1) over NH-land, while over oceans it has decreased by 0.75 W m−2 (−0.125 W m−2 year−1). The situation is different in the SH, where SSR has decreased over both land and oceans, but more over oceans (−3.67 W m−2 or − 0.61 W m−2 year−1) than land (−1.35 W m−2 or − 0.225 W m−2 year−1). Globally, SSR has decreased over land by 0.455 W m−2 (or − 0.076 W m−2 year−1), while over oceans it has decreased by 2.21 W m−2 (or − 0.37 W m−2 year−1). Note that from the above tendencies, only those for SH oceans and SH land plus oceans are statistically significant at the 95% confidence level. Tendencies of surface solar radiation (W m−2) computed over the periods 2001–2006 (reference), 2001–2005, 2002–2006, and March 2000–February 2007. Results are given separately over land, ocean and land + ocean (including coastal areas, i.e. ISSCP pixels with both land and ocean). Bold numbers indicate statistically significant trends at the 95% confidence level. Yellow- and blue-coloured cells indicate same and opposite tendencies compared to the reference period (2001–2006). Previous studies identified changing points in the evolution of GDB over the last two decades of 20th century, namely around 1990 and 2000. In this study, we updated GDB beyond 2000 by extending the time period into this century and obtained the analyses of SSR variations over various world regions, as well as at global/hemispherical/continental scales or station sites, also providing some insight into their possible causes. The SSR variations were obtained here all over the globe, for the first time at the local (pixel-level) scale, based on 2.5° × 2.5° analysis. An overall global dimming (based on coastal, land and ocean pixels) is found to have taken place on the earth for all-sky conditions, from 2001 to 2006, arising from a stronger solar dimming in the SH (ΔSSR = − 2.88 W m−2 or − 0.48 W m−2 year−1) and a slight brightening in NH (ΔSSR = 0.17 W m−2 or 0.028 W m−2 year−1), thus exhibiting an interhemispherical difference. This inter-hemispherical difference in post-2000 GDB, which has not been reported in previous studies, translates to a substantial difference in the magnitude of the decreasing SSR tendencies over oceans, and even to a different sign of tendencies over land, with Δ(SSR) = − 0.225 W m−2 year−1 (dimming) in the SH and Δ(SSR) = 0.07 W m−2 year−1 (brightening) in the NH. Moreover, the regional patterns have a remarkably patchy spatial structure, with opposite SSR tendencies in neighbouring areas, even within the same continents, as for example in Europe, USA, South America, Africa and Asia. The model-computed tendencies of SSR are supported to a large degree by surface-station measurements taken from the GEBA and BSRN networks, which strengthens the validity of the post-2000 GDB findings of this study. “Drives weather and climate changes” – Wang et al (2012). Recent papers in the international literature on global dimming found a mixed pattern in data from New Zealand. Closer analysis of pyranometer data from four long-term sites shows a downward trend up to 1990, with a reversal at three of them after that time. How much can be attributed to the direct aerosol effect is uncertain from the pyranometer data, but aerosol optical depth data from Lauder show too little aerosol for this to be a substantial component. A comparison with much longer records of sunshine hours shows that there was a trend of increasing cloudiness to around 1990, and a decline since then, consistent with the global pattern. There are few New Zealand climate stations with pyranometer data before 1970. The four with the earliest data are at Auckland (37.0°S, 174.8°E, WMO 931190, Nov 1969), Wellington (41.4°S, 174.9°E, WMO 934370, Jan 1954), Christchurch (43.5°S, 172.5°E, WMO 937800, Jan 1960), and Invercargill (46.4°S, 168.3°E, WMO 938440, Jan 1954). …………………For comparison with other sites and studies, note that the annual average hourly downwelling short-wave fluxes for the four sites here are: Auckland, 172 W m−2; Wellington, 161 W m−2, Christchurch, 156 W m−2; Invercargill, 142 W m−2. The NIWA Climate Database also holds sunshine records for many islands in the South Pacific. Table 7 shows these data, and New Zealand’s Raoul, Chatham, and Campbell Islands, analyzed as above. Analysis of New Zealand pyranometer data for the few sites with a long record shows general agreement with trends described in the global dimming and brightening literature. The performance and calibration stability of standard pyranometers is barely adequate for observing small changes in mean radiation over decades, and this makes it very difficult to reliably distinguish the direct effect of aerosols in clear sky data. The clear skies over New Zealand, even at a time when global dimming was most pronounced, suggest that observed changes in pyranometer data for clear skies are indeed a calibration artifact. Nevertheless, 100 years of sunshine hour records tell a story of changing cloudiness on decadal time scales, over a region larger than that represented by New Zealand. Explaining, or better, predicting such changes is an important challenge for models of Earth’s radiative balance. Obviously SSR over NZ land does not drive NZ temperature. Ocean SSR and SST, wind direction etc, have more influence by far. Wellington is not typical of the SH but Christchurch is (to a degree). In other words, such a small area of land in the middle of the ocean (NZ) is somewhat meaningless in terms of climate drivers. If audacity was an Olympic event he’d get a gold medal. A “bold prediction” of something that is already supposed to be happening but isn’t happening. If their bold prediction is wrong, then will they boldly tell us so, or sweep it under the carpet? Greenhouse gases are already having an accelerating effect on sea level rise, but the impact has so far been masked by the cataclysmic 1991 eruption of Mount Pinatubo in the Philippines, according to a new study led by the National Center for Atmospheric Research. We saw it! We saw it! In our model! We saw the acceleration! We SHOULD see it! We SHOULD see it! Because we saw it in our model! We see SHOULD see the acceleration! Next decade! We SHOULD see the acceleration! Next decade! We SHOULD! We SHOULD! Why aren’t people believing us? This is not science. This is speculation. The resulting estimates of the GMSL trend from 1900 to 1990 range from 1.2 mm yr−1 to 1.9 mm yr−1, albeit with significant decadal variability about this long-term trend [1, Fig. 13.7b]. Coupled with the higher GMSL trend observed during the satellite altimeter record discussed above, the tide gauge record demonstrates unequivocal acceleration since the early 1900 s, with estimates ranging from 0.009 +/− 0.002 mm yr−2 17 to 0.017 +/− 0.003 mm yr−2 20. Based on these same studies, however, the majority of the acceleration arises from a shift that occurs around 1990 when the rate of sea level rise increases to the satellite-measured trend of 3.3 mm yr−1. So it’s actually “insight” from tide gauges “coupled” with satellite altimeters. Beenstock et al found 65% of good quality long-running tide gauges were flat or falling. Andy, your nitpickery about slopes and gradients with regard to CC is irrelevant. The rate of acceleration of SLR in the future depends on many factors and feedbacks and also on our actions to revert the CO2 trend or the lack of the same. Your mathematical number play will have no impact on that whatsoever, nor will it inform you or the CCC about prudent methods of risk management. Do maths teachers not teach maths anymore? If numbers are not needed, then presumably neither is maths. An estimate of this near-future GMSL acceleration can be made using LE projections of OHC, TWS, and PW in conjunction with independent estimates of future ice sheet losses [1, Figs 3 and 4]. The estimate suggests that, as discussed above, it is unsurprising that acceleration has yet to be detected given the forced response to Pinatubo and the noise of internal climate variability in both OHC and TWS (shaded regions of Figs 2, 3, 4), and potential retrieval biases12. Moreover, the result also demonstrates that as anthropogenic influences continue to increase (as a result of both increasing greenhouse gas concentrations and decreasing anthropogenic aerosol emissions), a detectable acceleration of GMSL rise is likely to emerge as it exceeds the noise of background climate variability (shaded) in the coming years. The main contributor to this acceleration is the accelerated increase in OHC, which is offset somewhat by increasing but secondary influences from atmospheric and terrestrial storage (Figs. S2 and S4), while a key component of the noise obscuring acceleration is the variability of TWS. Moreover, when the effects of the Mt Pinatubo eruption estimated form the LE are removed (blue), acceleration becomes apparent, even in the present day. The magnitude of the acceleration in the mid-21st century is estimated here to be 0.12 mm yr−2, though this value depends strongly on future ice sheet losses, which are highly uncertain1. Its accurate estimation depends both on the accuracy of altimeter retrievals and our ability to distinguish it from internal variability, which can be pronounced in some years but over the long term becomes increasingly negligible, particularly if acceleration is estimated from the full post-1993 record (red line in Fig. 4). Turns out to be “0.12mm yr−2”. So given Andy’s calcs and my reasoning (? ), Fasullo et al’s speculated “acceleration”, which SHOULD be due to begin NEXT decade, is LESS than a 30cm by 2065 scenario and further out anyway. That’s assuming Fasullo et al multi-speculated scenario ever actually happens of course. Yes SLR is accelerating. No it has not yet been detected. This is unsurprising. The strange logic of CO2-centric climate science. Schmidt will be frantic. There’s still another 6 months of 2015 data to come in. Lew thinks there are “three main tactics of climate denial”. The AGs are political appointments. The law has been subverted for a cause. “It will mean that they can create privilege for what are otherwise public records, even when shared with ideological activists and donors, so long as everyone who wants to keep their scheming secret agrees in advance,” Horner told The Daily Signal. The lawsuit, filed July 27 in Rhode Island Superior Court, calls for Kilmartin, a Democrat, to release records that were not previously disclosed in response to the legal organizations’ request in April. At issue is a “Climate Change Conference Common Interest Agreement” that, email records show, Kilmartin’s representative signed along with representatives of 16 other state attorneys general. Lew’s “necessity of conspiracism” appears to be necessary for the Democrat attorneys general preparing to prosecute climate change skeptics. I’v been trying to warn them for a month, but they blocked me and listened to climate fraudsters instead. And then went on a massive drinking binge. I think they could be in serious trouble, because the southerly winds coming in tomorrow will likely compact the ice around them. Funny how this report [Fasullo et al] talks about the Pinatubo eruption in 1991 causing a “Decline” in sea level which is conveniently just before the Satellite Record begins. shows that the actual fall in sea level happened in 1986 or 87 and was in fact recovering before during and after the eruption. The SkS “rising faster as time goes on” curve (Blue, Church 2008) is no more than a positive inflexion 1920 – 1940. 1991/92.5 is on the trend line (Blue). Prior to that there was below-trend 1984 to 1991 measurements and prior to 1984 there was on-trend measurements, more or less, right back to 1940. After 1992.5 there is a minor drop below the trend 1992.5 to 1997 after which the data goes above trend and back to trend. Satellite altimetry begins 1992.9595 (Red). This is right at the bottom of the 1992.5 to 1997 drop below trend (Blue). In other words, satellite altimetry missed on-trend 1991/92.5 measurements. It also missed the on-trend 1940 to 1984 measurements. If satellite altimetry had captured the actual long-term trend prior to 1992.9595, the satellite trend would be much LESS than the current 3.4 mm/yr. Fasullo et al’s rationale is that had not Pinatubo occurred, the satellite trend (Red) would begin on-trend (Blue) at 1992.9595 rather than below it. There is no justification for that rationale whatsoever.The reason satellite altimetry begins below trend is that it started way too late (unfortunately). Fasullo et al’s rationale is fatally flawed. With a newly released poll showing an overwhelming majority of voters — including Democrats — oppose the investigation, the coalition of attorneys general pressed on, urging a federal court in Texas to uphold a subpoena filed by Massachusetts Attorney General Maura Healey against Exxon Mobil. The amicus brief filed in support of the Massachusetts investigation comes with the coalition showing signs of fraying after suffering a series of setbacks. So far only three of the 17 attorneys general — those in Massachusetts, New York and the Virgin Islands — have acknowledged starting investigations into Exxon or other entities since unveiling AGs United for Clean Power at a March 29 press conference. Even those probes have run into problems. In June, Ms. Healey placed her investigation on hold, saying she would not enforce the subpoena until the court battle with Exxon was resolved, which could take years, according to a document obtained by E&E Daily. The Virgin Islands probe all but collapsed in June after Attorney General Claude E. Walker agreed to drop a subpoena issued against Exxon, a month after he said he would withdraw subpoenas of the free market Competitive Enterprise Institute. Both Exxon and the institute had fought the subpoenas. Meanwhile, Iowa Attorney General Tom Miller has so far refused to sign a common interest agreement allowing the prosecutors to communicate on their probes without disclosing the details to the public. A January report in the Los Angeles Times said that California Attorney General Kamala Harris is investigating Exxon, but since then, her office has refused to provide details or even confirm that the probe is taking place. Republicans and free market groups have accused the attorneys general of abusing their prosecutorial authority in order to chill debate and advance an ideological agenda, while a Rasmussen Reports poll released Tuesday showed that 69 percent of likely voters oppose targeting climate skeptics. “These AGs look very partisan, and I think they’re in a very controversial area here,” said political analyst Floyd Ciruli. New Hampshire Attorney General Joseph Foster signed in April a common interest agreement indicating his decision to join the coalition even though he did not participate in the March press conference, which featured Vice President Al Gore Jr. In that sense, the attorneys general may be better aligned with the party’s ascendant progressive wing than with Democratic voters as a whole. Only 21 percent of Democrats polled by Rasmussen said they supported prosecuting climate skeptics, while 28 percent said the debate over global warming is not settled. Exxon is cooperating with the subpoena issued in New York, which has powers exceeding those of other states to investigate financial and shareholder fraud under the Martin Act, according to the motion filed Tuesday. In Massachusetts, Ms. Healey is investigating whether Exxon and its supporters violated the state’s Consumer Protection Act. “Like all state attorneys general, Attorney General Healey has the power to investigate potential fraud taking place in Massachusetts, just as I am investigating whether Exxon defrauded New York consumers and investors,” said Mr. Schneiderman. In their 34-page brief, the attorneys general urged U.S. District Court Judge Ed Kinkeade for the Northern District of Texas to reject Exxon’s effort to block the subpoena, arguing that the company is attempting to use the federal courts to bypass state sovereignty. “Protecting a state’s citizens from fraud, deception and other improper conduct is a principal and critical state law responsibility of state Attorneys General,” said the brief. Missing from the amicus brief were three of the original 17 coalition prosecutors: Ms. Harris, Connecticut Attorney General George Jepsen and Virginia Attorney General Mark R. Herring. And you need to have, as with the Scientific Method, a connection between something scientifically declared and an observational basis for the declaration, and that simply doesn’t exist. And you need to have, as with the Laws of Thermodynamics, a connection between something scientifically declared and a politically-driven scientific declaration, and that simply doesn’t exist. That’ll make the Warmists frantic. Wouldn’t a temporarily lowered starting point mean that sea level rise rates are overestimated? They’ve got it backwards. Pinatubo temporarily cooled Earth, lowering sea level. A lower starting sea level would accelerate rate of sea level rise. Must be wonderful to be a scientist these days. Remember a line from Beatles song “you can get wrong and think it’s alright”! How did this get past peer review? Silly me! Anyone with synapses firing can see the fatal flaw immediately but authors and peer reviewers can’t. Are the Colorado marijuana laws the problem I wonder. New group publication: “Is the detection of accelerated sea level rise imminent?” by Fasullo et al. These guys tie themselves in knots. They end up fooling themselves with their own convoluted reasoning. But it grabs headlines via the usual conduits – that’s the main aim. Mission accomplished. Look, you are putting on weight. Even though the scales haven’t changed, the weight gain is masked by the exercise you are doing. I like the anolagy inalogy inallergy inollergie metaphor. But kilos, Andy, kilos, not pounds. Get with it, old timer old-timer oldtimer. “This is a nice way to visualize the warming that’s still in the pipeline due to ocean thermal inertia. Re “Observed and eventually expected (“real”)” graph. Note that the GISTEMP 30-year mean has been projected from 2001 to 2016 (dotted red) i.e. they cannot accept that there was a negative inflexion in the 30-yr mean at 2001 because it doesn’t fit their CO2-driven story. The GISTEMP LOTI mean to end of June was 1.095 C but still another 6 months of 2016 data to come in. These guys are in for a rude shock when the 30-yr GISTEMP mean is calculated with full year data for 2016, 2017, 2018 etc. And > 99% likely that Gavin Schmidt will have to swallow a dead rat, eat crow, humble pie, whatever. Credibility zero. In short, their CO2-bias, and therefore their approach to determining the secular trend (ST), leads them into a fallacy..
Bernard Beauzamy, président de la Société de Calcul Mathématique : « Le phénomène d’élévation du niveau de la mer n’a strictement rien à voir avec le réchauffement climatique. These guys are in for a rude shock when the 30-yr GISTEMP mean is calculated with full year data for 2016, 2017, 2018 etc. Yes, at 2001 they have a 20 year ocean/atmosphere LEAD/LAG. This is at least reasonably correct. But at 2016 they have about a 27 year air temperature LAG. 20 years is probably characteristic but for some unknown reason they seem to think oceanic thermal inertia is extending rapidly, 7 years longer in only 15 years 2001 – 2016. This is dead wrong.They obviously have never heard of the oceanic “time constant” in respect to thermal inertia. But the “time constant” is not a specific time in years (e.g. 20 years), it is a characteristic range of years (e.g. 20 +/- 10 = 10 – 30 years). So Toceaninertia cannot be a thin line, it must be a range similar to their Tpaleoclimate but of constant width. Next error is that they assume atmospheric temperature drives ocean heat (rather than ocean heat driving atmospheric heat – think El Nino) because they have extended Toceaninertia (orange) past the 1C anomaly line at 1989. Toceaninertia should STOP at 1989 (1C) i.e. air temperature at 2016 corresponds to ocean heat uptake 27 years earlier.at 1989 (by their Toceaninertia curve – wrong as above and below). Because they have got ocean-atm heat transfer reversed, they have got the wrong Toceaninertia profile (orange). Their Toceaninertia profile is derived from GISTEMP. This is dead wrong too. Their Toceaninertia profile should be the OHC curve – not GISTEMP. The OHC curve LEADs air temperature by maybe 10 – 30 years i.e. air temperature response to peak OHC in 2015 will not be until 2025 – 2035 ish. Similarly, air temperature at 2001 was a response to OHC over about 1971 – 1991, 10 – 30 years earlier. Now that Sun input to Ocean is reducing (but only minimally to date in terms of TSI – SSR is the greater forcing), Atmosphere temperatures are being sustained, and will be sustained, by heat stored earlier in Ocean. By about 2025 to 2035, solar input is predicted to decline significantly (?). It remains to be seen what the OHC curve will look like but at some date it MUST peak because solar input is reducing. 2015 might have been peak OHC (I’ve been wrong on this before, could be wrong again). What all that means for Schuttenhelm and Okhuijsen’s 30-yr GISTEMP mean (Tmean, red line) is that Tmean must peak around 2025 – 2035. Given the “adjustments” to OHC by Josh Willis, Tmean may peak sooner.It looks that way right now. Thus the upside down world of CO2-centric thinking and Dutch “science journalists”. Schuttenhelm and Okhuijsen assume a 30-yr GISTEMP mean (Tmean, red line) 2001 – 2016 based on CO2 rise because there’s not enough data to calculate the actual profile (15 years short). At 2016 their 30 yr Tmean is at the TOP of the GISTEMP observations at the El Nino Peak i.e. there is NO temperature data whatsoever to support that CO2-based assumption. In other words, the data in June 2016 is already well below their assumed 30 yr mean at 2016 and will be even lower by 2018 after a La Nina, maybe 0.65 vs 1.2+. 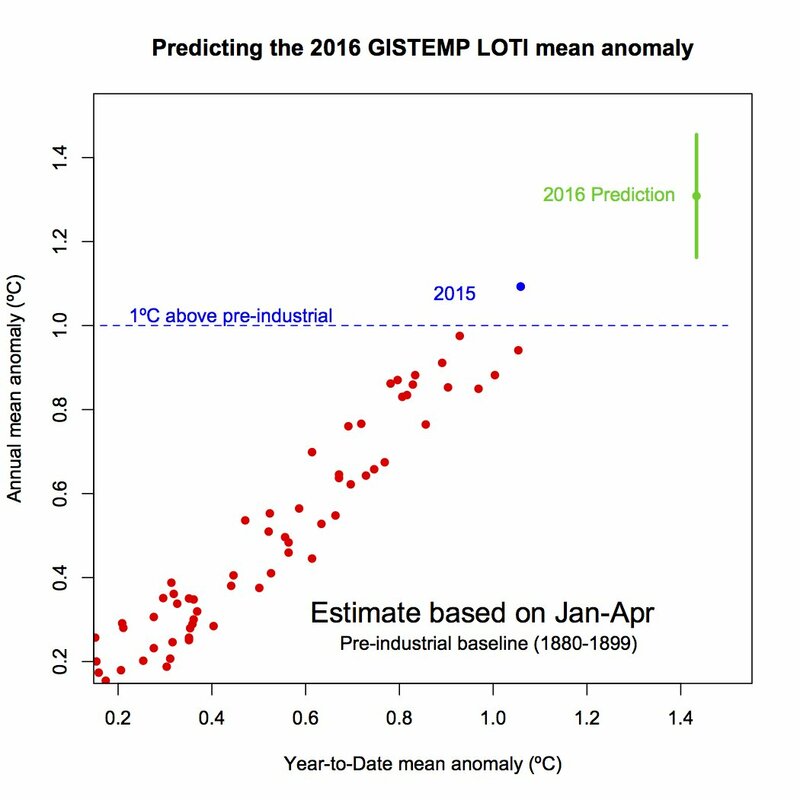 Schmidt predicts a 1.3 C anomaly for 2016 (plus or minus). Which I thought at first was a little more than Schuttenhelm and Okhuijsen’s assumption. But I’ve just seen that Schmidt’s graph uses a “Pre-industrial baseline (1880-1889). This is NOT the GISTEMP LOTI baseline. Schmidt’s 2016 prediction is 0.2 C higher than 2015. So from those LOTI data sheets 0.87 + 0.2 = 1.07 C for 2016. This is only a fraction below the YTD mean (1.095) with 6 months of data still to come in and La Nina cooling. 0.54 C drop in 4 months Feb to Jun. Only another 0.23 C drop in 6 months and the 2016 mean would equal the 2015 mean (0.87). Remember, ENSO-neutral is about 0.65 and conditions will cross ENSO positive to negative this year i.e. neutral at some point before the end of the year. Schmidt’s “> 99% likely to be a new record” just does not look credible. Now in his UAH updates he is including a section on the possibility, or not, of a record warm year. August 1st, 2016 by Roy W. Spencer, Ph. D.
Given the behavior of previous El Ninos as they transitioned to La Nina, at this point I would say that it is unlikely that the temperatures will remain above that projection for the rest of the year, and so it is unlikely that 2016 will be a record warm year in the satellite data. Only time will tell. Roy Spencer says it is “unlikely” to be a new record 2016 vs 1998. There will have to be as much data ABOVE their 2016 1.2C 30 yr mean assumption 2016 – 2031 as there was BELOW it 2001 – 2016. I wish them all the luck in the world with that but not a good start. That wont be worth an imperial tuppence by 2018. Figure 8. Average of all five adjusted data sets. In other words, all of Foster and Rahmstorf’s data manipulation can be replicated simply by projecting a 30-year running mean as per Schuttenhelm and Okhuijsen. Thus the CO2-centric view of GMST is basically just a projection of the 30-yr mean. This is a fallacy as both the ongoing additional data and sophisticated signal analysis clearly reveal. CO2-centric thinkers all miss the turn of the century inflexion in the data trajectory. They’ll see it eventually but it will take time – lots of time. Interesting going back through the Open Mind comment thread above in January (‘Correcting for more than just el Niño’). I don’t understand the cause of the apparent change in the warming trend at the end of the 1970s. Since you have removed most of the noise from the record, presumably leaving only CO2 concentration in the atmosphere, there seems to be no reason for such a sigificant change at that time. Surely if aerosols (often used to account for the upkick) were so significant, it would be sensible to have removed their impact as well? Is there any other comparable shift in the rate of warming in the record? Perhaps 1910 might bear some comparison? So apparently, according to Foster, the radical change in GMST in the 1970s after all known extraneous factors had been "removed" by Foster was due to "anthropogenic"aerosols. So what happened in the late ’70s? Clean air legislation and the introduction of the catalytic converter among other things. Catalytic converters are wrecked by sulfur compounds, so gasoline had to be reformulated to remove the sulfur. Acid rain became a concern–again sulfates were an issue. Also, aerosols probably still suppress warming to some extent, particularly due aerosols emitted by Asian economic tigers like China and India. Would you care to offer some evidence to support the assertion that aerosols were reduced dramatically in the mid-seventies, in order to explain the rapid and sustained return to warming? Why hasn’t the massive increase in aerosols and dust in India and China had any similar effect on global warming – given that China is now burning more fossil fuel that the US? [Response [Grant Foster]: First things first: go read this. So when discussion gets inconvenient for Foster (AMO – oceanic oscillation – natural variation) he reverts to Ad Hominem and shuts down discussion. So much for “Open Mind”.